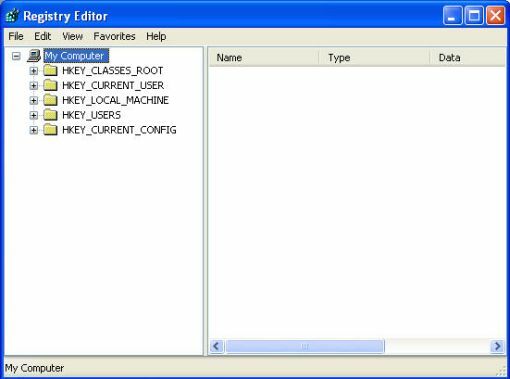 "Windows Registry Editor - The Starting Point to Discover the Registry Secrets"
Windows registry editor are a place that allows you to see all the registry entries. You also can use registry editors for viewing, adding, deleting, and modifying registry elements. However, it's not advice for a computer beginner to alter anything on the registry as it can cause your computer Windows corrupted. All versions of registry editors supplied with all versions of the Windows operating system are automatically installed during the installation process. However, neither of these registry tools are included in the Start button, and Setup doesn't create desktop shortcuts for them. From the Run dialog box displayed, type in regedit. Click OK.
As you can see, the Registry Editor has a user interface similar to that of Windows Explorer. If you click [+] to the left of the folder, this will expand the respective registry key displaying its subkey hierarchical structure. This operation expands the key tree to the next nesting level. If the subkeys contain other nested keys, they'll also have the [+] sign to the left of the folder. The subkeys, in turn, can also be expanded to view the next level of registry hierarchy. When you reach the lowest level of nesting, the [?] sign will appear to the left of the folder icon. This means that the key can't be expanded further, and you can only go up the hierarchical tree. If neither the [+] nor [?] icons are present, this means that the key doesn't contain any subkeys. The menu bar contains the following menu items: Registry, Edit, View, Favorites and Help. The status bar indicates the path to the selected registry entry. It's helpful when you need to view the full path to the registry key containing the selected registry entry. Registry value entries are displayed in the right pane of the Registry Editor window. Each value entry contains three parts: name, data type, and value data. Data types that describe the registry value entries are displayed in the Type column. The Data column contains text or binary data that correspond to the value of the selected registry entry. You can edit, create, or delete this data to optimize software functionality or troubleshoot problems. 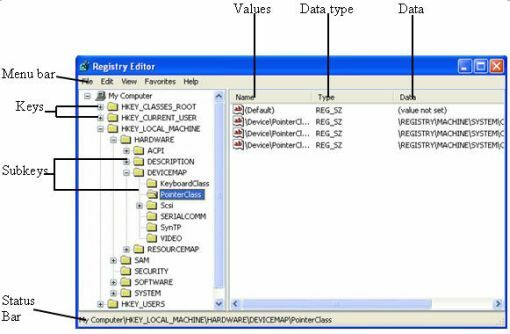 If you browse around the Windows registry editor, you will notice that it's very complicated. So please do not change any value on it if you are unsure what you are doing. Also, remember that improper use of registry-editing tools can cause the registry errors and Windows problems. If you really got the registry problem, the easiest way is to use the registry software to scan and fix the problems. I recommend you to get this award-winning Windows Registry Cleaner.